This story was produced in collaboration with KCUR, the public radio station in Kansas City. Of all the freedoms Anthony Flanagan lost during his eight years under state care, the right to vote was among the toughest. Flanagan, a quadriplegic deemed unable to care for himself because of psychiatric issues, lived under legal guardianship by the state of Missouri from 2008 to 2016. Often seen as protective of people incapacitated by mental illness or developmental disabilities, guardianship can also strip people of many rights the rest of us enjoy, including the right to vote. Flanagan admired Barack Obama during his presidential run in 2008, thinking him intelligent and articulate. Though he doesn't consider himself a member of either political party, Flanagan was disappointed that the state deprived him of the chance to vote in an historic election. "Like most of the country, I was like 'Wow, they're really gonna elect a black president! This is cool,'" Flanagan, now 49, said. "I was like, 'Oh man, I wish I could vote.'" Of the 31 states that have such laws, Missouri by far removes the highest number of people from voter rolls due to mental incapacity. When Flanagan was placed under guardianship by a state court judge in Columbia, he became one of the 10,018 people who have been purged from Missouri voter rolls in the past decade because of mental incapacitation or incompetence, according to a federal survey of state and local election officials. An investigation by APM Reports and KCUR found that between the 2008 and 2016 election cycles, Missouri purged more than double the number of voters for mental incompetence than any other state, followed by Kentucky (4,907) and Virginia (3,905). Proponents of these laws say they help protect the integrity of the election and prevent voter fraud, but critics say the one-size-fits-all nature of these laws discriminates against people with mental illness by preventing them from exercising their constitutional rights. Michelle Bishop of the National Disability Rights Network said these Americans are the last constituency whose rights can be taken away based on identity. There are no federal laws that address voter competency, she said. "Do we have actual clear-cut evidence that that many people are somehow not competent to cast their vote?" Bishop said. "How are so many people being stripped of one of our most basic and vital rights? This is the one right on which every other right we have depends." From the 2008 election cycle through 2016, Missouri purged 10,018 registered voters from the rolls because they were deemed mentally incompetent. Missouri's total was not only the highest in the country but more than double the state with the next highest total, Kentucky. Flanagan was paralyzed in 1987, at age 18, after being hit by a car while walking home from a party outside his hometown of Seymour, Missouri. Years later, in 2007, he was going through what he describes as a "rough patch" — severely depressed and abusing his prescription medication. He didn't seek the help he needed, Flanagan said, and his friends and others worried he was going to hurt himself. That started the legal process, and a judge was asked to deem him unable to make decisions for himself. Flanagan says he suddenly found himself removed from his apartment by police, put in a psychiatric ward and placed under a legal guardianship by a state judge, in January 2008. A public administrator was named to make all decisions for Flanagan — from whether he could have a cell phone to whether he was correctly treating his diabetes. Though Flanagan needed help, he also was deprived of some basic freedoms. Under Missouri law, Flanagan fell under full guardianship, meaning his rights to drive, marry, vote or own a firearm were rescinded. In partial or limited guardianships, a disabled person may retain some rights, but advocates say that many are unaware they are losing anything and don't ask the court for the distinction. Being found mentally incompetent can be applied to those with a range of disabilities, including Down syndrome, schizophrenia, bipolar disorder, autism or developmental disabilities. Those with Alzheimer's disease or a traumatic brain injury can also be placed under legal guardianship. Beyond the mental impairment, fear of voter fraud drives proponents of these laws. They say the ballot of a voter with dementia or other severe problems could be filled out by a family member or a caretaker at, for example, a nursing home. In effect, the family member or caretaker gets to vote twice, which is illegal. The laws were written into state constitutions years ago, using outdated terms like "idiot" and "lunatic," when people with mental illness were viewed as childlike, said Jennifer Mathis, deputy director of the Bazelon Center for Mental Health Law, based in Washington, D.C. She describes the laws as promoting "global incapacity" — if a person is incapacitated to do one thing, he is believed unable to do everything. It's an outdated approach, Mathis said. The modern notion of mental capacity is "if you lack the capacity to make the decisions necessary to ensure your basic health and safety, that doesn't mean necessarily that you lack the capacity to vote or to do other things." 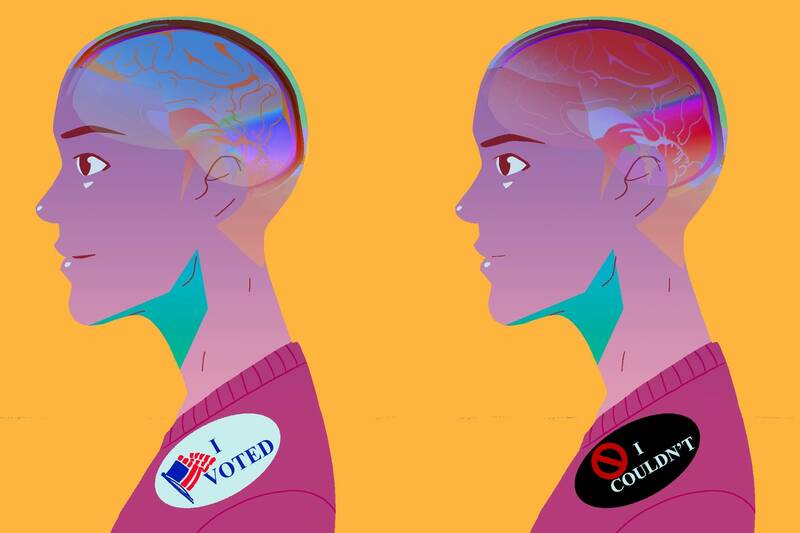 Research done by Dr. Paul Appelbaum, director of Columbia University's Division of Law, Ethics, and Psychiatry, found that people with mild Alzheimer's disease and nearly all people with a serious mental illness have the capacity to vote. But he also found that people at the greatest risk of not having that capacity are those with moderate to severe Alzheimer's. "One of the key issues, of course, is when a person becomes so disabled that they should no longer be considered to have the capacity to vote," Appelbaum said. The growing number of seniors with dementia, high voting rates among the elderly and ever-closer elections in highly contested races shows the need for better identifying capacity in voters, Appelbaum said. Advocates point to a 2001 federal court decision in Maine as a move toward defining just what capacity is. In the decision, a federal judge overturned a state law that barred people with mental illness from the polls, saying it violated the Americans With Disabilities Act. He found that people could vote if they could "understand the nature and effect" of the vote and had the ability to make a choice. "My bottom line on this issue is that while the integrity of the voting process requires some standard for determining when people are too incapacitated to vote," Appelbaum said, "in a democracy like ours that standard should be a low one, to facilitate access to the franchise for everyone who can reasonably comprehend the process." Leslie Anderson, director of public policy at Services for Independent Living in Columbia, Missouri, said she was not surprised by the high number of purges for mental incapacity in the state. Anderson blames it on several factors: Missouri courts tend to use full guardianships, rather than limited ones; the people placed under guardianship often don't know their rights; and some don't have a support system to advocate for them. "So if they don't have an eligible person to be their guardian, then of course they go for public administrators, and then usually that's full guardianship," Anderson said. "There has always been this thought that a person with a disability is incapacitated anyway, that they don't know what they're voting for." But Terry Hammond, who is on the National Guardianship Association's board of directors, doesn't see Missouri's high number of purges as a negative. Hammond, who works in the Brazos County, Texas, courts, said Missouri has a more fully developed public guardianship system because there is a judge in every county overseeing the system. "I think that that probably results in more people's needs being met through guardianship," he said. "But as a result of the judicial findings and rulings, then that means you're going to have more people having their voting rights affected." In Texas, for instance, Hammond said the state and counties have abdicated the guardianship role and non-profits are running the system. There are waiting lists for people who are seeking guardianship status in Texas, he said. "This isn't like buying a hot dog at a hot dog stand where you stand in line," Hammond said. "This is really a serious, important need and it's not the kind of thing you want to have waiting lists for." Missouri has a history of restricting the mentally incapacitated from the ballot box. In 2007, a state court found that if a mentally incapacitated person wants to vote, he or she can petition a court. The case was brought by Steven Prye, a former law professor who suffered a mental breakdown but still wanted to vote. Anthony Flanagan hated guardianship. He felt "locked up" in the nursing home where he lived for seven years. He couldn't control his money, and his cell phone and computer were often taken away. "I never committed a crime, and here I was being held prisoner," Flanagan said. "I was stripped of my rights, and I couldn't vote. I couldn't do a lot of things." Then he fought back. He got sober, lost weight to combat his diabetes and got a good lawyer who listened to him. He wrote long letters to the judge, writing that when his computer and phone were taken away, he couldn't communicate with his loved ones. "And I feel these punishments are demeaning and very impractical, at the very least," he wrote. "I would only hope that nobody else like me ever has to go through a difficult time in their life ... and put under such unreasonable conditions, such as I have." In July 2015, Flanagan petitioned the court and was taken out of guardianship in February 2016. Flanagan now lives in Columbia and recently registered to vote online. He's most concerned with local issues, especially those on disability access and health care. "I'm glad to be alive. I'm glad to be free," he said. "I'm glad to have my own apartment and be able to live on my own, and I just really treasure that." On Election Day, Flanagan plans to get in his electric wheelchair and go to his old polling place, the church around the corner from his building, the aptly named Freedom House. Peggy Lowe is an investigative reporter with KCUR. Support for this story was provided by the Corporation for Public Broadcasting.